During 2011 LOT has been discussing with Tanya Moore of Cornwall Learning the feasibility of presenting a portfolio at Advanced level. In October 2011 Maggie attended a very informative conference at the Royal Cornwall Showground Pavilion. The event was organised by Cornwall Learning. 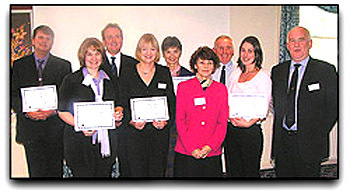 Five organisations achieved the ‘Established’ QiSS Kitemark: Callington Community College, Helston Community College, Mullion School with The Lizard Outreach Trust and The Pyramid Trust in Cornwall were presented with their certificates by Doris Ansari ‘Executive Member for Lifelong Learning’ at The Study Support Conference in October 2004 . They all achieved ‘Established’ Level Quality In Study Support Status. From right to left: Dr Pat McGovern, Susie Phillips, Tony Roberts, Doris Ansari, Maggie Roberts, Jo Whitehall, Mike Sandford, Petrina Missions & Jonathon Plunkett. The aim of QiSS is to support schools, LEAs and other educational organisations in raising students' achievement, motivation and self esteem. Study support is now seen as an initiative of proven effectiveness in raising standards of pupil attainment and increasing pupil motivation. "It's great to get a national award for our projects"
The QiSS accreditation, valid for 3 years, was due for Revalidation. LOT applied for revalidation independent of Mullion School: the original accreditation was as a partnership. Although maintaining a close relationship, Mullion and LOT are providing fewer joint projects. Following the Recognition meeting on the 11th July 2007 at the Pirates Learning Zone in Penzance, the scrutineers made suggestions for LOT to consider in respect of future developments. LOT will respond to all these suggestions and would be very happy to be approached by volunteers wishing to help carry the vision forward.